In 1991, the world-famous iconic designer, Giorgio Armani created the Armani Exchange subbrand. Inspired by street and dance culture, the watches in the line are incredibly stylish and flexible fashion watches designed for the modern and fashionable wearer. The designs in this line range from loud and bold, to elegant and classy, and in this short review, we take a short look at 5 most incredibly designed watches in the line. Kicking off this set of reviews is arguably the most flexible watch in the line. The AX1326 features an elegant design that revolves around simple contrast. The black stainless steel case on the watch is accentuated by the silver crown and tachymeter buttons which contrasts the black dial with white hands and hour markers perfectly. The sleek and classy design on this watch allows it to work perfectly as a dress watch for formal events. Especially with the A|X logo being a centerpiece on the dial’s design, while also looking great with a business suit for when you’re on the job. With a bright white finish, multi-face dial, and silicone strap rest assured that wearing this watch will definitely turn heads. 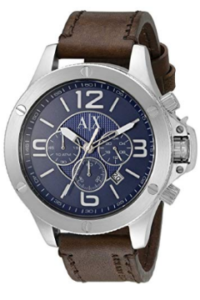 The AX1325 is a watch with an incredibly polished and fashionable look. 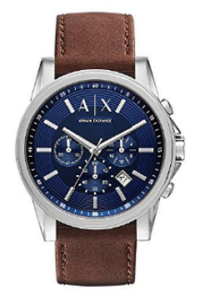 The dial has a ribbed texture that adds a very fine, yet noticeable detail on the watch while the iconic Armani Exchange logo sits perfectly at the 12 o’clock position. Pulling off loud white watch such as this may be intimidating, but the as loud as it is, the AX1325 is more flexible than one might think. The watch also uses a Japanese quartz movement, which is about as good as it gets with fashion watches. This is the perfect watch for those who won’t shy away from a bright look, while also allowing room for a lot of experimentation. 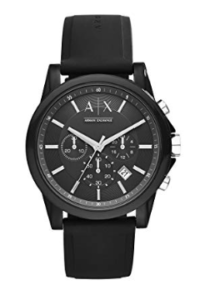 For a classic and timeless watch design, the AX2058 is by far the go-to watch in this line. With a classic 45mm stainless steel case, mineral crystal, and classy dial design, this watch was made for those who love the classics. Watches in this line are known for beautifully designed dials, and this watch doesn’t fall short by any means. Pairing a white background with white hour markers, a ribbed texture, and black markers on the three subdials is reminiscent of the old-school watch designs that we all fell in love with at one point. Everything is kept simple in this watch, from the details to the design, to the reliable Japanese quartz movement, which gives watch collectors and wearers a simple watch that’s sure to catch people’s attention. This watch would go perfectly with an everyday work suit, while also being a great addition to your favorite suit saved for only the most formal occasions. For a watch with a design that’s eye-catching while simultaneously falling under the umbrella of “old-school” inspiration, look no further than this watch. The watch forms a perfect contrast with its deep blue dial, brown strap, and stainless steel case. The watch, like most others in the line, uses the Armani Exchange logo as an eye-catching detail at the 12 o’clock position, while also having the ribbed texture that’s seen on most watches in this line as well. The 45mm case is the perfect diameter for a standard large men’s watch nowadays. 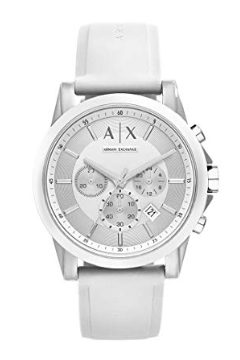 But with all the eye-catching details on this watch (such as the Armani Exchange initials on the crown) the watch’s size is less noticeable. Another truly flexible watch by Armani as the watch can easily be paired with both formal and casual outfits. The Armani Exchange subbrand was created with innovative and modern designs in mind, and that philosophy is very evident in the AX1505. For starters, the case measures 48mm in diameter, which is large even by today’s standards, but since it’s paired with a modern dial design, the largeness is barely noticeable. It’s no secret that Armani knows how to pair their colors well, and they did just that with the blue, silver and brown tones of the watch. This watch is designed to stand out with any outfit, so it’s best paired with a nicely tailored business suit. If you’re considering any watch in this line, there’s one very important thing to remember: these are fashion watches. Fashion watches are designed to look great, but they aren’t designed to be heirloom watches, so expecting one of these watches to last you more than a decade will leave you disappointed. 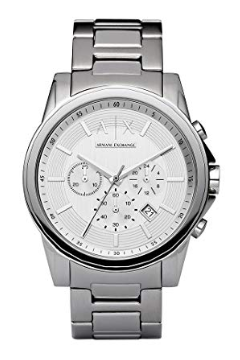 However, getting an Armani Exchange watch knowing the nature of fashion watches is definitely a unique experience. For the modern, fashionable watch wearer, the Armani Exchange line is a line that’s worth serious consideration.